These Aloha Turkey Burgers are everything you love about a big juicy burger, and the fact that they’re made with ground turkey is a deliciously pleasant surprise! If you’re of the mindset that turkey burgers are bland, dull and dry…get over it! This Aloha turkey burger is wonderfully moist and packed with the big bold flavors of red bell peppers, cilantro paste, ground ginger and those wonderfully crunchy, French fried onions that I don’t think anyone can resist. And, if that’s not enough, the sweetness of a King’s Hawaiian burger bun, a juicy slice of pineapple, and a slice of nutty melted Swiss cheese pull it all together even before you’ve had a chance to add a big dollop of the teriyaki ketchup to finish it off. Be still my Hawaiian steal drum beating heart!!! -Whisk the ketchup ingredients in a small bowl and set aside until ready to serve. -In a large bowl, mix the first 10 burger ingredients and form into 6 evenly sized patties. -In a large skillet, over medium/high heat add 1 tablespoon oil and fry the burgers on both sides, until they are nicely browned on each side. *Note – This is best to do in two batches of 3 burgers each and will take approximately 3 minutes per side. -Remove the browned burgers to a 9″ x 13″ casserole dish that has been sprayed with cooking spray. *Note – these burgers are not fully cooked at this point and will require additional cooking in the oven. 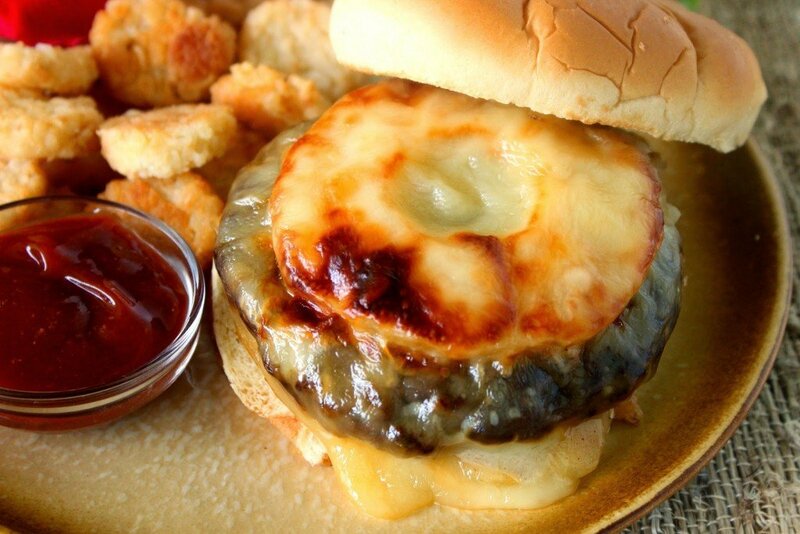 -Top each browned burger with a pineapple slice and slice of Swiss cheese. -Bake the burgers in a preheated oven for approximately 15-20 minutes until cooked through and have reached an internal temperature of 165 degrees and the cheese is nicely melted and browned. -Place each burger on a bun and serve them along with the teriyaki ketchup. If you’re a regular reader here, then you know that I always like to do a photo collage of the step-by-step processes of most of the recipes you’ll find here. I’m sorry I don’t have that for this recipe. Unfortunately the cat knocked my kitchen camera off the back counter and it wasn’t working properly on the day I made these burgers for the second time. Should you have any questions for me about the process of making these burgers, please don’t hesitate to leave me a comment and ask away. I’m always happy to answer any questions you may have. And, if you ARE a regular reader here, then you also know that I like to coordinate my hand painted glassware and/or tile items along with the theme of the recipe posted. Naturally, this one a no brainer as a compliment to the Aloha Turkey Burgers. I just love those little hula dancers, don’t you? LOL And what about that wedding cake out on the surf board? The things clients ask me to paint for them never ceases to amaze me! If there is ever anything I can paint for you, please don’t hesitate to contact me or visit my shop which is located within the navigation bar. Custom orders (like this one) are always welcome, and I can work from any photo or description you send my way. Until we eat again and Aloha! 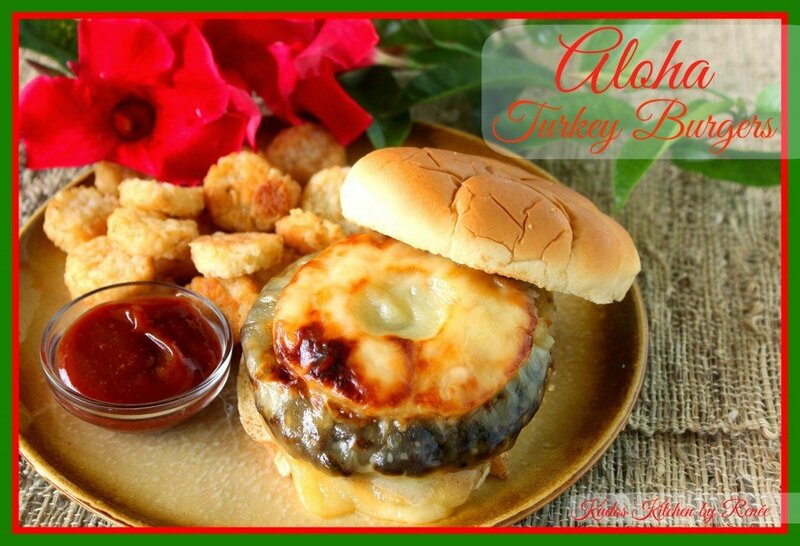 I love the pineapple ring on the turkey burger– what a great addition! Oh yes, please. I love pineapple on burgers and this looks magnificent! YUM! This looks perfect for summer! 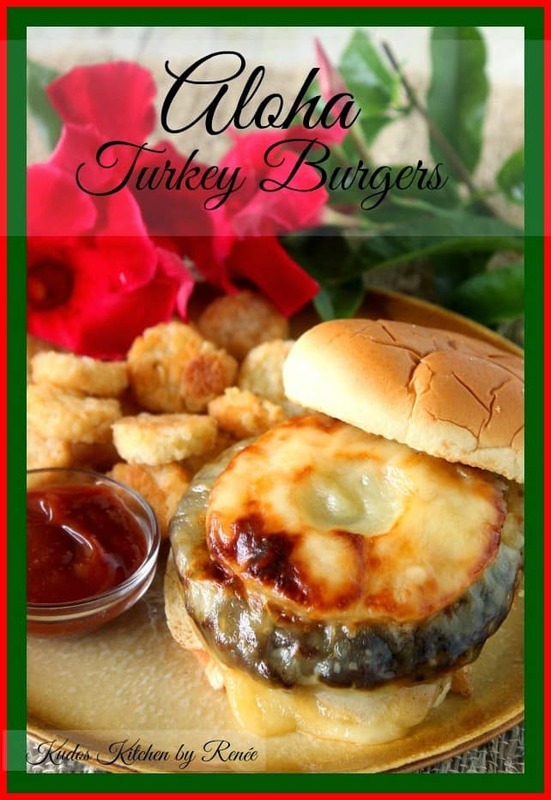 This burger sounds delicious and I love that it's turkey! I think I could use this same recipe and sub in some veggie sausage for the turkey and have an incredible vegetarian sandwich! Thanks for the inspiration! This looks so incredibly good. So summery and I love that it doesn't require a grill. I'm not always one for pineapple on burgers but you are changing my mind right now! This burgers sounds and looks incredible! I see why you had to tuck one away. I'm usually in the "turkey burgers are too bland" camp, but with all these flavors, how can this one be anything but awesome? I love pineapple in savory dishes and I am a fan of everything Hawaiian including this awesome burger! I'd sure love a big giant bite of that right now. Yum. I actually have never out pineapple on a turkey burger before.